Samsung Galaxy Tab S 10.5 is the full-size member of the freshly announced tablet family by Samsung. Like its smaller sibling, the Galaxy Tab S 8.4, the newcomer capitalizes on the world's only 10.5-inch Super AMOLED screen panel and aims to capture a spot at the top of the tablet hierarchy, currently dominated by the Apple iPad Air. The South Korean manufacturer has thrown some of the best hardware out there into the tablet's ultra-slim body, headed by stunning Super AMOLED display with the ultra-high resolution of 2560 x 1600 pixels. The increasingly important class-leading tablet user interface based on the latest Android KitKat is on board as well - there's enough of it to satisfy even the most discerning user. 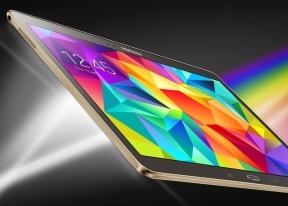 The high-resolution Super AMOLED display is undoubtedly the tablet's biggest highlight. The screen has been racking up accolades since tablet's announcement for a good reason - it is simply stunning to look at. The rest of the hardware is not too shabby either. The list of available features includes IR port and fingerprint sensor and is certain to satisfy even the biggest spec sheet junkie, while the new design language will certainly appeal to the Samsung Galaxy S5 owners looking for a matching tablet companion for their smartphone. GPU performance is one of the major question marks in the Samsung Galaxy Tab S 10.5 - we found the Mali-T628 GPU to be lacking in flagship-worthy oomph when we tested the smaller Tab S model. We will surely take a close look at how the big brother handles graphic-intensive tasks. Does the Samsung Galaxy Tab S 10.5 have what it takes to send the Apple iPad Air home packing? Read on to find out! As always, we'll kick the review off with on unboxing, followed by design and hardware inspection. Powerful beast! Multitasking, vibrant display, impressive battery life! I still love it!!! !